Where to Buy Fusilade Herbicide, Fusilade II Turf and Ornamental herbicide - Qt - $77.15 for Sale with Fast Free Shipping! 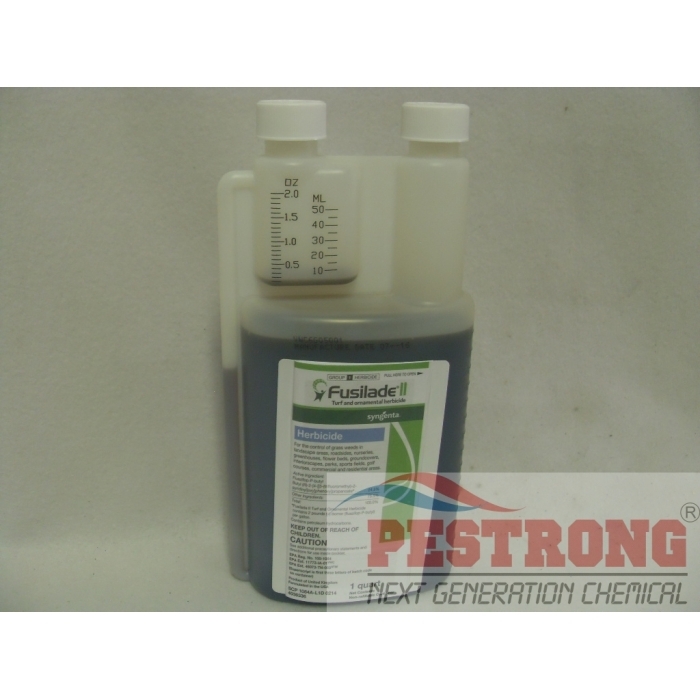 Fusilade II Turf and Ornamental herbicide - Qt controls a long list of both perennial and annual grass weeds in a variety of turf and landscape areas. Extremely fast and effective, Fusilade II can be applied over-the-top or as a directed spray without damaging valuable ornamental plantings. It can also be used at reduced rates to safely remove Bermudagrass from tall fescue and zoysia grass. For control of of grass weeds in landscaped areas, roadsides, nurseries, greenhouses, flower beds, groundcovers, interiorscapes, parks, sports fields, golf courses, commercial & residential areas. Apply 0.4 – 0.6 oz./1000 sq. ft. (16-24 oz./A) of Fusilade II in sufficient water along with 0.25% (1/2 pt./25 gals.) of a nonionic surfactant. Use only nonionic surfactant on ornamentals. Do not use a crop oil concentrate with Fusilade II on ornamentals. Helps control torpedo grass infestation in my garden without hurting other plants. Sprayed 2 times in 3 weeks and the grass is now brown. Will keep spraying regularly during growing season. I apparently "filed" this message and did not respond in a timely manner. Last summer I used the Fusilade II product I purchased from your company on our flower beds, as outlined in the instructions on the bottle, in my on-going battle with bermudagrass. This product worked GREAT. Grass basically died after the first spraying but I sprayed a second time as instructions said. The grass never returned for the remainder of the year. The product did what the ad said it would do, kill the Bermuda and not hurt our plants. Hard to control bermudagrass in my fescue. This fusilade provides safe to fescue, fatal to bermuda. I like this.